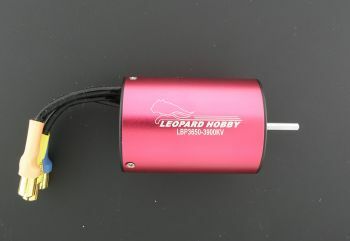 36mm Diameter by 50mm Long Brushless Motor by Leopard Power. Hand wound for high efficiency of up to 90%. Comes with high-quality bearings and neodymium magnets for high power. Includes endbells that are assembled with screws for both strength and ease of maintenance. We now have these in both 1/8" or 5mm motor shafts. We offer this in 8 versions. Watts: 600 with up to 1200 burst. Flat Spot on shaft for tightening coupler screw to. Mounting Holes 25mm apart for use with most 540 mounts. I've had this motor for a few months now and like it a lot. Its been emerged in water a few times and still works good. 6mm connectors it comes included: fantastic. Tight fit.